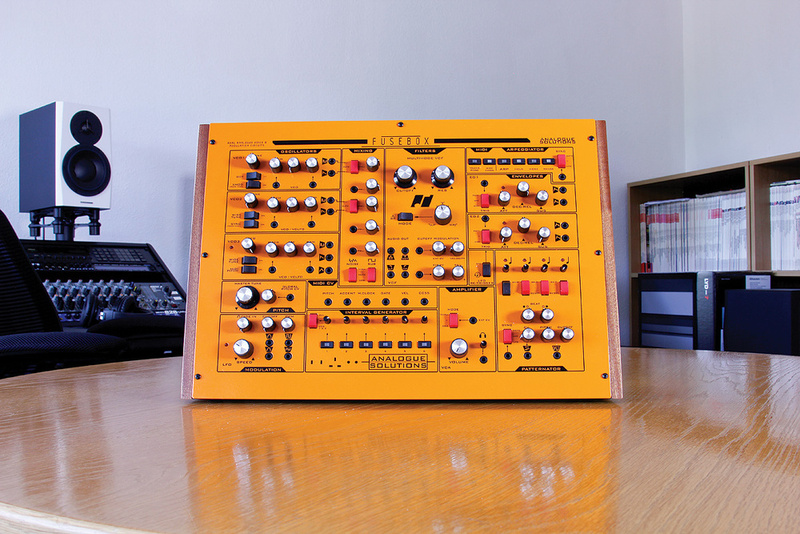 Analogue Solutions’ new semi‑modular synth is as flexible as it is fun. The current fashion is for pick ’n’ mix Eurorack modulars, but I have to be honest I’m more drawn to flexible desktop semi‑modulars like the new Fusebox. Eurorack’s appeal is that you get to design your own dream synth but, honestly, Analogue Solutions’ synth brain Tom Carpenter is going to do a better job than me of curating a collection of modules into a usable (and affordable) instrument. And that’s exactly what he’s done with the Fusebox: a synth toybox that teams a flexible three‑oscillator monosynth architecture with various musical performance and sequencing tools, and extensive MIDI integration and patching potential. And there’s no compromise going this route: this is a true analogue synth, you’ll find no digital control or patch memory here. The Fusebox is Orange. I think it looks nice. That’s all there is to say about that. In its default upright configuration it’s freestanding, with just a slight backwards tilt. If you prefer it can be rejigged to lie considerably flatter, which would be great if you want it right in front of you on a desktop, or if you’re standing up playing live. 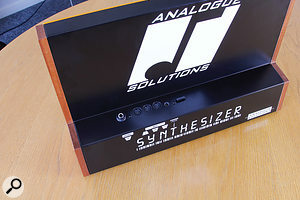 Alternatively you can detach the end cheeks and rackmount the synth with optional brackets. In the spirit of testing everything I had a go at switching to the flat mode. This is done by removing the front panel and flipping it around. I failed (later realising that I probably needed to remove and re‑seat the ribbon cable linking the panel to the I/O and power board to make this work), but it did give me the opportunity to see what was inside, which is a lovely clean single‑board design. Boutique analogue synths might enjoy the mystique of mad tinkering science projects, but in this case the reality is tidy and professional electronic engineering. The case itself is all metal, with sustainably sourced wooden cheeks. Most of the knobs are nice and chunky, with metal end‑caps. They have a fairly weighty torque, perhaps just verging on the stiff side. The plastic rocker switches were the only part of the Fusebox that I wasn’t too sure about. They feel a bit wobbly and don’t provide particularly reassuring physical feedback about their position. I did forget about this pretty quickly once I got going, though. With so many plugs on the front panel, connections at the back are limited to a quarter‑inch audio output, MIDI in, out and thru ports, and a socket for the external power supply.The Fusebox is not a complete wedge: there’s a back chunk which the panel projects out from. This leaves an inset surface in the back of the chassis where the I/O is tucked away tidily. There’s a connection and switch for the external power brick, the quarter‑inch mono audio output and MIDI. We’ll come back to MIDI, but for now let’s just hear it for MIDI thru. It’s so useful to have this, especially being able to pass through MIDI Clock, and it allowed to me get a bunch of gear working together without a computer or dedicated MIDI host box. The panel is split into 14 modules. There are three VCO sections, a mixer (which also hosts more sound sources), a filter, two envelope generators and an LFO. There’s a MIDI input section with the Arpeggiator, a step‑sequencing module called the Patternator, and the Interval Generator which stores a series of global pitch offsets. Then there’s an array of MIDI to CV/gate converters. Much of this is patchable, and there are extensive, adjustable internal connections. With so much to explore I thought I’d start with something simple and see what the Fusebox can do as a synth, with no patching or internal sequencing. So I set aside the included bag of yellow patch cables for later and plugged in a direct MIDI connection from my trusty Novation Circuit. VCOs 1 and 2 automatically track MIDI pitch. The envelope generators need to be flipped into MIDI trigger mode. Env 2 is connected to the VCA, while Env 1 modulates the filter with a dedicated bi‑polar depth control. The two main VCOs are fed into the mixer via individual switches and level knobs. The rocker switches select between square, sawtooth, or off. And that’s it, you have sound. VCO 1 has a restricted tuning range, with just a switch to select between two octaves, and a knob for fine‑tuning/detuning. VCO 2 has the same detune control, but also has a Wide Tune mode which gives you full‑range control from under 1Hz up to the supersonic (at least where my ears are concerned). Both oscillators have a pulse‑width control that goes from a symmetrical square at one end to a narrow pulse at the other. VCO 2 can be synced to VCO 1, opening the door to all your favourite sync effects, and VCO 1 has an X‑mod switch which pitch modulates it with VCO 2. With no depth control this tends towards extreme results, but of course you can cross modulate via the manual patch points if you want finer control. VCO 3 is not normalled into the mixer, you need to patch it manually into one of the three spare mixer inputs (which are also useful for external inputs or doubling up the waveforms from the oscillators). That said, this source bleeds through a bit anyway; when I didn’t want to hear it I turned the frequency to minimum. This oscillator is essentially the same as VCO 2 but can be disconnected from MIDI, allowing it to double as an extra LFO. This is aided by having a triangle output as well as the square and saw. On top of the main LFOs there’s a noise source and a sub, both of which are switched into the mixer at two preset volume levels. With two or three of the primary oscillators running, I rarely felt the need to include the sub, but at the Low setting it gives you some nice extra beef, and in the High position things get ridiculous! One thing to note is that the sub’s pitch is derived from VCO 3, so is effectively taken out of action if you’re using this oscillator as an unpitched LFO. The filter is a variable multi‑mode design, roughly along SEM lines. Apart from the dedicated band‑pass mode, the filter output morphs smoothly between modes, via a knob, from low‑pass, through notch, to high‑pass. There are separate outputs always available for each of the filters, although as the main filter out cannot be detached from the VCA there’s not really a way to isolate those within the Fusebox environment. You can however feed those outputs back into the mixer for some subtle tonal changes and phasing. Of course, in the context of a wider modular system these connections become very useful. The two fully analogue envelope generators have conventional ADSR stages, but with the decay and release times linked and controlled via a single knob. In the context of a synth that spends much of its time playing sequences, I didn’t miss separate controls here, and if anything this made it faster to manipulate during playback. The ability to go very short on the times was repeatedly useful for creating percussion sounds, snappy sequence lines and fast transient attacks via both filter and pitch modulation. 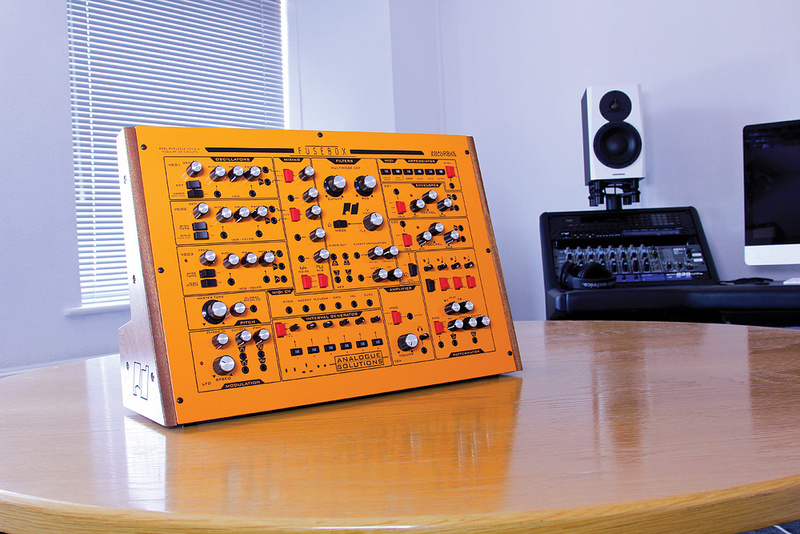 The Fusebox’s slightly monolithic front panel will lend a splash of colour to any studio. OK, so that’s the raw specs, but how does it sound? My first impression was that it’s raw and gritty, but as we became more acquainted the Fusebox showed me an increasingly impressive range of sonic goodness. Certainly you can get coarse monosynth results, and when sequenced it can sound 101‑ish, but the three oscillators and sub can soon stack up and outgrow this and start sounding like big classics. The filter hits a real sweet spot. It can play nice and smooth, provide nice Moogy stickiness, or push into acid squelch, without the gain scoop at high resonance. Even at its most resonant it doesn’t go over the top into annoying shriek. I particularly liked dialing up just from the full left position to get the fatness and punch of the low‑pass while opening up the sound. I also liked morphing from low‑ to high‑pass while dialing the Env mod the opposite way from positive to negative. The overall character has a Oberheim SEM feel, with echoes of other Analogue Solutions synths like the Nyborg. It is unmistakably analogue, always having a slightly untamed edge, I think even more so than some of the classics it’s inspired by. This makes it the perfect antidote to plug‑ins. Sometimes synths that style themselves as ‘semi‑modular’ are really more or less fixed, with a few patch points added on as a bonus. Fusebox is not one of these. It’s more like a true modular that someone who knows what they’re doing has patched up with some cables and said, ‘there, that should get you started’. Almost every predetermined routing can be switched off, attenuated and overridden. Many typical modulation connections are already in place. In most cases these are controlled from the source, such as with the PWM and cutoff knobs located on the LFO module, and the pitch and cutoff knobs on the Patternator. An exception is Env 1’s modulation of the filter, which is set by an attenuverter on the filter module itself. Making manual connections via the patch points doesn’t break the normalled routings, so the modulation sources are summed. Likewise with switched connections, such as the VCA mod, envelope triggers, or Patternator sync, you can overpatch and double‑up gates or mod if you want. A lot is possible, but what can’t you do? Well, on the audio side the mixer and filter are joined at the hip with a direct internal connection. The only way into the filter is through the mixer, and the only way out of the mixer is through the filter. Similarly the VCA has no patchable input, it’s a direct connection from the filter, although the filter has independent outputs. On the CV/MIDI side you can’t modulate the envelopes or LFO. You can’t have everything, but it would have been nice to be able to mod at least one of those decay/release controls with velocity or the Patternator. What I did really miss was the ability to sync the LFO in some way. It can’t be clocked, or retriggered in phase. While we’re getting the minor complaints out of the way, I found that the attenuators showed a slight step up from the zero position to the minimum voltage, so I couldn’t, for example, set a really subtle amount of pitch mod. The Fusebox may be a stand‑alone toybox that’s also packed with modular synth patchability, but its equally well connected in terms of MIDI. Many parts of the synth can take gate and pitch information from MIDI without patching. On top of this there’s a generous MIDI conversion section, with patch‑outs that you can use both within the Fusebox and in your wider modular rig. Given that so many parts of the synth already have dedicated switches to take pitch or gate from the MIDI inputs, the most useful output to the rest of the Fusebox is the clock. I had this connected to the Patternator most of the time. The gate and pitch connections I mostly used to integrate with external gear (see the ‘Outside The Box’ box). What sets the Fusebox apart is the collection of built in sequencing and performance tools. The most conventional of these is the arpeggiator, which operates on incoming MIDI. This is similar to the arp/step sequencer on the SH‑101 or OP‑1, in that it will store and replay up to 16 notes, which you can tap in with one finger if you have Hold active. By default the notes will play in the order they were pressed, but there are reverse and back‑forward modes. There are two range modes beyond basic playback: one octave up, and an up/down mode which plays one octave up then one down, which is nice. Also similar to the 101 is the Transpose mode that lets you repitch a held arp sequence by playing MIDI Notes. The manual also says this works for the Patternator, although for some reason I didn’t get this working. Sync/tempo for the arp can be provided by a clock signal (from the Fusebox’s own MIDI Clock converter or from outside) and/or LFO or Note. The Note setting is an interesting feature, which is also available on the Patternator. This advances the sequences a step when receiving a MIDI Note 0 (C‑2) input, allowing you to create your own rhythmic patterns. The manual suggests using your DAW for this, but that seemed a bit fiddly, so I created some different patterns on an Octatrack and this added yet another way to make on‑the‑fly variations to performances on the Fusebox. The Patternator module looks a little esoteric but is quite simple. It contains a separate four‑step arp/CV sequencer and eight‑step gate sequencer. Clock options are the same as for the arp (but set independently). Four knobs set the step values, all unquantised as nature intended. Each step has a rocker switch that determines its behaviour. All steps can Play or Skip, with Skip effectively shortening the length of the sequence. Steps 2‑4 also have a Reset mode which immediately sends the sequence back to step 1. By flipping these switches on the fly you can introduce live variations and polyrhythms into the sequence. The gate sequencer is controlled by a space‑saving two‑knob system, where each knob introduces more gate triggers at they are turned clockwise. The first knob controls the even steps, and the second the odd steps, so with both pots fully open you get eight regular steps per measure. When synced to MIDI or clock there’s no way to change the step lengths. Last but not least is the Interval Generator. This stores six different global pitch offsets for the synth (VCO 3 can be excluded), recalled via a row of push buttons. Each pitch offset is set via an unquantised pot. The idea is that you can quickly set up a series of intervals and turn anything the synth is doing into a song progression. What’s nice about this idea is that it doesn’t matter how you’re generating a sequence to begin with. Whether you’re running with the arpeggiator, external MIDI or CV sequencer or the Patternator, the Interval Generator gives you an independent layer of transposition. This proved brilliant for integrating modular‑style sequenced lines into an existing song or live jam. You can simply tune the intervals to the chord progression in the song and jump right in. The Fusebox is a compact synth playground, offering much of the fun, flexibility and sound of a suitcase modular, but with the convenience and relative accessibility of an all‑in‑one synth. In almost every case pre‑wired connections can be attenuated or switched — the modules may be ‘fused’ but very little is committed. While mono/paraphonic, the synth’s various oscillators can stack up to some monstrously fat analogue sounds, and the X‑mod, Sync, versatile filter and extensive patchability offer a surprisingly wide palette. Snappy envelopes combined with multiple sequencing options make the Fusebox particularly useful for pin‑sharp sequences with interesting percussive rhythms and polyrhythms. At a point in time where the Eurorack scene is increasing looking to digital technology for inspiration, the Fusebox proudly takes its cue from classic untamed analogue instruments. And above all it is an instrument, with a refreshing focus on performance and jamming. Apart from other Analogue Solutions synths there’s little else out there that directly compares with the Fusebox’s combination of features and form factor. 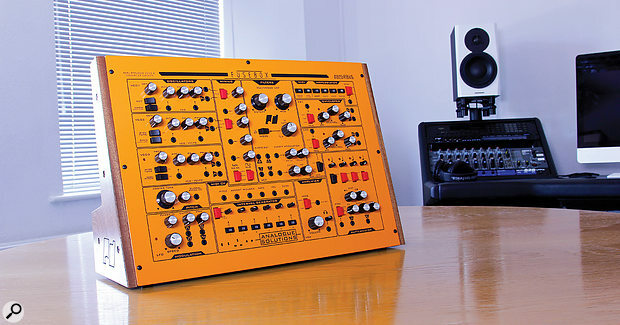 For other all‑in‑one packages with a foot in both the desktop and modular worlds you might check out the SoundMachines Modulör114, possibly a Pittsburgh Modular bundle like the System 301, or maybe a pair of Moog Mothers. Although the Fusebox has its own self‑contained little modular synth playground, it’s crying out to play with other kids. In fact there are more patch points and mixer inputs than you’re ever likely to need just for making connections between the internal modules. The Fusebox is directly compatible with Eurorack standards, but for most of the review I was running a little table‑top rig, with the Fusebox melded with the mighty Make Noise 0‑Coast, and variously a Circuit or Octatrack for MIDI and sequencing. Even this modest setup expanded the possibilities no end, and proved immense fun. There was plenty of available connectivity to swallow up the 0‑Coast as an additional voice, triggering it via CV and gate, and using the Fusebox’s generous complement of extra Envelope and LFO outputs. The Fusebox mixer has three unassigned mixer inputs, leaving two spare if you use VCO 3, so I patched in both a raw oscillator source and the 0‑Coast’s final output. I found myself drafting in the CV logic section of the 0‑Coast to do stuff with the Fusebox’s mod and pattern sources that it couldn’t do on its own. Rocker switches don’t inspire confidence. You can’t sync the LFO. You lose the sub if VCO 3 used as LFO. The Fusebox packages the Analogue Solutions sound into a self-contained semi-modular toybox. The built-in sequencing tools and Interval Generator make for fast idea creation and easy live performance. And it would also make a great starting point or bridge into a wider modular studio.